Seriously you guys, how cute is this couple?? As an engagement photographer, it is always so easy for me to photograph a couple so in love. Courtney and Clay were having such fun together during their session, and their love for each other really shines through in the photos. For a lot of couples, it can be really hard to figure out what to wear to your engagement session. Since my editing style is already organic and romantic, it helps when you choose something along those lines as well! 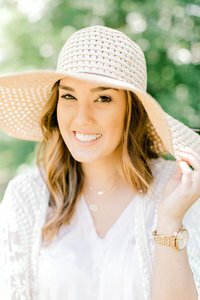 Courtney is so good with fashion, so I thought this was a great post for What to Wear to your Houston Engagement Session! Courtney is a fashion blogger, so of course I knew her outfits were going to be on point! But along with her amazing style, she was also able to gain some tips from a session/style guide that I like to give to all my clients who book a session with me. The guide helped her put together perfect ensembles for her as well as her fiance Clay. I absolutely loved her choice of off the shoulder maxi dresses, because they provided just the right romantic and feminine touch; pairing perfectly with my shooting style. On top of that, Clays neutral attire complimented hers perfectly, and they just looked so put together, while managing to maintain that comfortable style. The outdoor backdrop on this beautiful day was gorgeous as well. This couple made it look easy, and the end result was some really stunning photos they will cherish for years to come! These two were such a joy to work with, and i was so honored to be chosen to showcase their special day. I know these two will have many happy years ahead. If you or someone you know would like to book an engagement session, please visit my website. I can’t wait to hear form you, and help you style your own beautiful engagement session.